... greatest **** EVER. Anyone else do the CBR Dominguez Crit in So-Cal today? I was there racing the 5s. I ended up getting 9th. The last lap there was a big move on the left on the slight downhill after the 1st turn, which put me from around 6th place to around 14th place. Had no choice but to move up on the uphill before the last turn which killed my chances for a sprint. I clipped my pedal on the 2nd corner--first time for that and luckily no problems. Even with the rain there was no crash today. A few more races to go 'till I'm a 4. Overall, good times. Anyone here going to the Roger Millikan Brea Crit? Nice work. Crits are my favorite, by far. 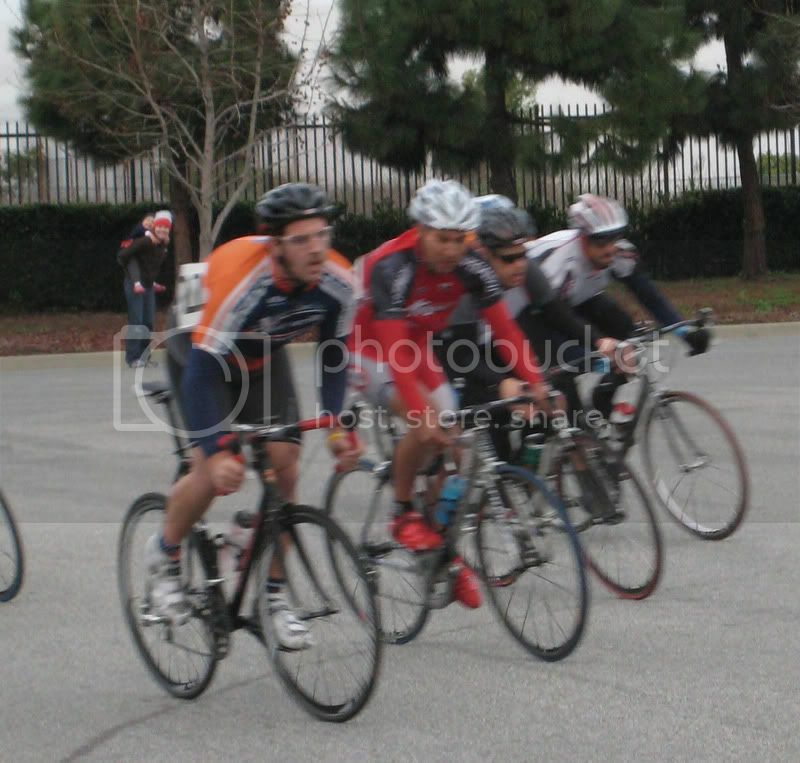 I'll be at Brea crit. I think I must have finished pretty far back, but I didn't get dropped like my road race, I even was able to sprint up the side to try and get to the front at the start of the last lap. I felt much stronger today and had a much better time, no close calls. Coming into the last lap I realized I was feeling pretty good so I got aggressive and moved up to the front with a sprint up the side. When we hit the down hill I set myself up on the inside drafting some other riders... bad move. 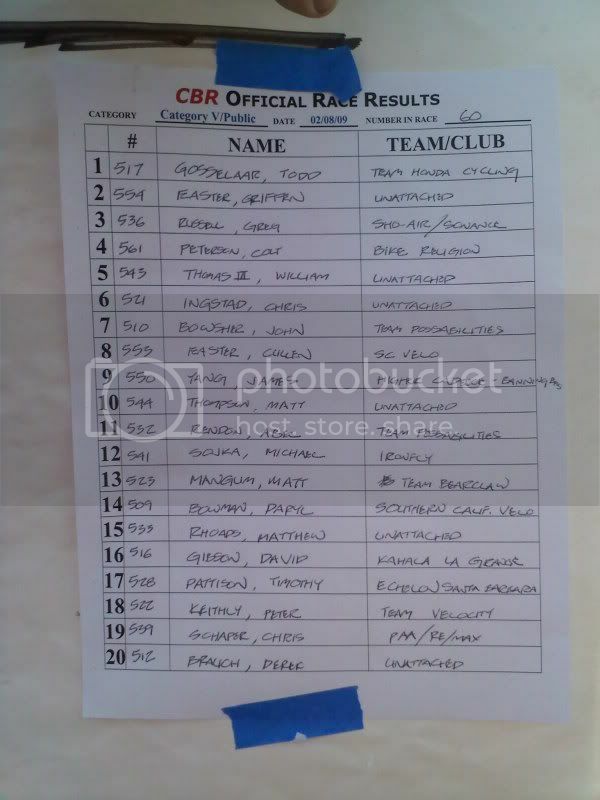 I was in the top 20 riders at that point feeling great and some dip **** cut across my front wheel and almost slid out in front of me on the 2nd turn causing us all to grab our brakes on the inside line and drop to the rear of the pack. Oh well, you live you learn, should have been on the outside. I gambled that the riders I was drafting had their **** together and were launching an attack but it ended up being a bunch of kids burning their legs with no plans and getting sketchy in the turns. SO much fun. I think I learned more about bike riding in those 30 minutes than the 10 months I've been riding bikes lol. Good job Nick! Brea is a fun course, but 3 weeks in a row of racing doesn't work too well with a wife and kids, so I'll most likely sit it out. Couple of notes...Normally the inside line is safer, that way guys won't push or slide out into you, sounds like you just had bad luck there. Sprinting to the front of the group, especially on the last lap or near the end is a good way to burn up your matches, and not have anything left for the finish. Move up when it's easy, a few spots at a time. By 3-5 to go you should have your spot up near the front and make the effort to maintain it. Also, once you're comfortable with it, practice moving through the group, rather than around it. It's taken me a couple of years, but I'm finally doing this with confidence, and it requires a lot less energy. Hi James, good to see you're out there. I would think after some of the moves we've been in, like the last Eldo last year, you could probably attack and get away with half a lap to go. Are you doing Eldo starting next month? I'll be there, but upgraded my CBR license, so I'll be hanging on for life in the P/1/2/3's. Nice job both of you! Learn as much as you can now, you'll be glad you did down the road. In one of my first few crits, I got my handlebars caught up with my teammate. We looked at each other and went "uh oh". Managed to talk each other out of that one. I was pretty pleased with us. Congrats on getting out there! here are the 5 results. I got 18th. I felt like $hit the whole race. Glad we missed the rain! Last edited by captnfantastic; 02-08-09 at 06:28 PM. Did you think about taking any drinks? Sounds like you had fun...good job. Sh*t can happen anywhere in the pack. Being on the outside of a turn is not necessarily safer. It's just a matter of everyone gaining some experience. Also remember that everyone in a Cat 5 pack is guilty of squirrely riding, including you. I was pretty shaky myself last year, and I expect I'll need a couple of training crits to work out the bugs this spring. I'm feeling better and better about it, though - on a group ride Saturday, one of the guys said "you're totally different rider than you were last year, you're very smooth now." Good for the ego! Good Job!!!! It wasn't an easy race... I've done training races with a few guys in that field so I know some are them are pretty strong..
Dude I gotta give it to you, you were right. I woke up 2 hours before the race had a small small bowl of cereal and then a gel just 20 min before the race. I also just went out with a half full bottle of water for the race and ended up drinking just a quarter of that half. I also spent more time focusing on my warm up and got my heart rate up much much higher before the race than i did at PCK, I felt SO much better. Yep. I was amazed how smooth (relatively) that race was for a bunch of 5s. BTW there was like 5 rain drops - not rain, the course was quite dry. I've done that course with 1/2 inch of water in turn 2 - Fun! I thought seeing that guy endo is what caused the split, but guess it was other stuff. Thanks for clearing it up Nick. Everything was going great I think the panic of the last lap set in and a lot of people went too hard for their own skills in the turns, and ending up grabbing gobs of brakes ya' know? Good job. Glad you were safe and had fun. One of the things I've noticed, the 5s--and to a lesser extent--the 4s go into corners tight, have to slow down, and then sprint like h*ll out of them. When the course is dry, the higher cats & masters go into corners wide, dive to the inside and scrape the corner tight, then exit by swinging out wide, all the while, maintaining their speed. There's not nearly as much sprinting out of corners in these levels. And even though your racing faster, and your heart rate average is higher, it doesn't feel as hard because you get in to a rhythm at the higher speed. It also makes the race a bit safer. Oh, and there's really not much you can do about it in the 4/5s, unless you're on the front dictating the line and pace through the corners. Hey I remember you! Yeah I'll be at El Do getting comfortable. I'll see you there. I'm not sure if my 1min power is good enough to do something like that, but I'll never know 'till I try it right? Anyways good luck with the 3s--you should be able to slide right in just fine.